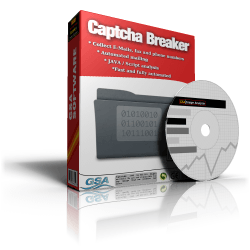 Buy GSA Captcha Breaker - Get 6k Free CAPTCHAs! After you get GSA Captcha Breaker, you won't need to type in very simple captchas manually or pay others to solve them again. GSA Captcha Breaker is a one time purchase, not a monthly subscription. The license is for a single PC only. GSA Captcha Breaker => Options => Select "Send captcha to the following service if solving failed" => "Add" => "9kw.eu" and use your 9kw.eu api key => "OK".